As a part of the MacStories Apps Tree event ,I had the chance to interview Chris Coyier, editor of Css-Tricks, an awesome and popular web design community. This is 12th of many interviews and guest posts I’ll publish on MacStories during this week. Hi! Can you please introduce yourself to MacStories readers? Howdy folks. I'm a web craftsman, blogger, author, and speaker. I attempt to keep a personal website where you can learn more about me. What can you tell us about the design scene in your country? I am from the United States. Clearly there is plenty of web design going on here, but part of the beauty of the web is that borders mean very little. There is great design happening all over the world. And while we are still influenced by our local culture somewhat, most web design inspiration comes from other websites which could come from anywhere. 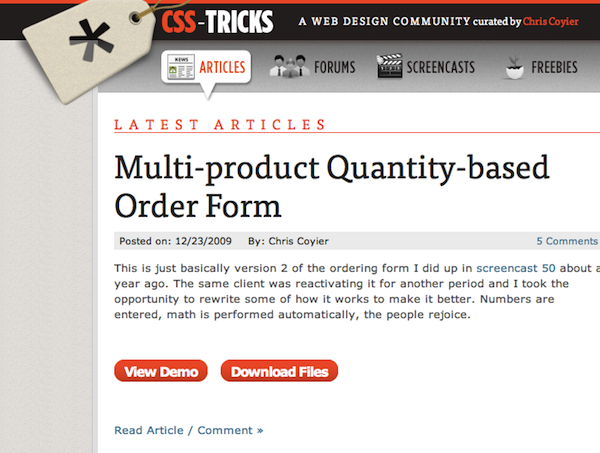 Css Tricks is very,very popular. Are you doing this all by yourself? Do you use Macs in your office? Can you please tell us something about your setup? I work alone from home. CSS-Tricks is something I do put a lot of time into, but it isn't enough to be my main career so I maintain a job working for a small design agency. I used to work on a 24" iMac, but unfortunately it recently died. It was able to be repaired, but I wasn't able to wait for that so I ended up buying a Mac Pro to replace it and I gave my 24" to my parents who were in need of an upgrade. I prefer desktop machines as I like to work at a desk in a proper chair with as much screen real estate as I need (2 24" Cinema Displays right now). I have a little cheapy plastic MacBook too, for travel and coffee shop usage, but I find it hard to actually do much "work" on a laptop. Have you ever tried other apps besides Photoshop / Illustrator? For example, Pixelmator? I've heard great things about Pixelmator, and I actually have it, but I haven't spent much time trying to use it in production. I'm all for trying new things but since I already own Illustrator and know how to use it, I don't have any hugely compelling reasons to switch. I am a fan of reaching for tools that you already know in order to stay as productive as possible. Which are your favourite Mac apps? Coda, Tweetie, Little Snapper, Skitch, 1Password, Firefox, Things, FontExplorer X, Creative Suite 4, iChat and iCal. That's 95% of what I use on my Mac and I think all of them are pretty darn well done. Let's talk about the Adobe CS suite for Mac. Many people think it's a simple porting of the Windows version, with an outdated UI and not so many "Apple style" features. Your opinion? A porting of the Windows version? I think somebody has their history mixed up there a little bit. Photoshop was originally a Mac exclusive product and only later did it go to Windows. Although criticism of it's interface being un-Mac-like is valid. Just take a look at how many different sliders there are in Photoshop alone. That's serious UI sprawl right there. I think ultimately is going to need to reign that stuff in and get us a smarter, re-thought interface. Do you use a specific software to organize all your work stuff like Yojimbo or Evernote, or do you still prefer a well organized Finder? I'm a bit of an in-between. My finder is probably more organized than most. I keep all my projects neatly segmented and nested folders inside of each keeping things in intuitive structures of my own creation. I do use many organizational tools though. Gmail keeps my email nice and organized. Things keeps my To-Do list in order. iCal keeps my schedule in order. Little Snapper keeps my screenshots in order. iTunes keeps my media in order. Applications are always moving in trying to help out, but I don't think I'm ready to give up my Finder. Is there something of Mac OS X interface you'd change? Or do you think it's already perfect as it is? Interface wise, I can't think of anything off the top of my head that gets my goat. The bigger thing to me is performance. Every time I see a beachball do a little laugh/cry. I have a brand new 8-core badass Mac Pro, and it's having trouble opening a save dialog box? C'mon now, something is wrong here. I think as awesome as OS X is, there is still some fundamental stuff that needs to get better and faster. Do you think the Mac platform is more suitable for designers? Is it possible to acheive good results on Windows too? Just look at the fonts situation alone on Windows. I cringe every time. Whatever the technology is behind it, different anti-aliasing or lack of font hinting or whatever it is, fonts just look terrible on Windows. I think it's beyond a personal aesthetic. I don't believe in personal opinions when it comes to fundamentals like this. If you like one shade of orange better than another, fine, but you aren't allowed to think fonts on Windows look better. So yes, I think the Mac platform is better for designers. Do you have / have you ever tried a Magic Mouse? Is it good for designers? I have one and I already gave up on using it. I was working a lot in InDesign at the time, and I really didn't like the horizontal scrolling. The vertical scrolling is great, but I didn't like the horizontal. I like moving pages around with the hand tool and knowing that once that's set I can go up and down with the scroll on the mouse and know that the horizontal is locked. There was no way to turn it off so I had to ditch it. I also found it a bit uncomfortable. Those hard edges didn't feel good. Then for a day I went back to an old school Mightly Mouse and it was amazing how much more comfortable the rounded shape was. My main workhorse mouse is a Kensington trackball. As a designer / blogger, what would you like to receive for Christmas? Books! Books about design, typography, or any art in general is the best. The word "inspiration" gets thrown around too often and I feel like I'm numb to it now. I'm sick of hearing it. But if there is one place I genuinely get inspiration it is from books. Sometimes I can open a beautiful book and get three pages deep before I'm so inspired I need to set it down and get to the computer to try and copy something. Thanks for chatting with us! And keep up the great work!